ALL INCLUSIVE KIT! INCLUDES HUB ADAPTER, BELTS, AC FITTING AND MORE! 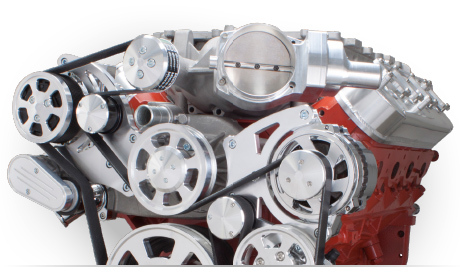 WRAPTORTM 8 Track Serpentine System for Chevy LS engines with Air Conditioning and Alternator. Unique 8 Rib Serpentine pulley design increases grip, reduces stretching and prevents belt slipping when compared to traditional 6 Rib designs. Spring loaded Gates belt tensioner ensures proper tension during hard acceleration and deceleration. Modular design allows you to easily add power steering in the future just by purchasing the power steering pulley and pump. Mounts Sanden Style Peanut AC Compressor up on the passenger side. Places the alternator on the driver's side above the power steering pump. Uses special LS water pump with provision for bolt on water pump pulley.